Hair Care For This Look! Hello everyone! 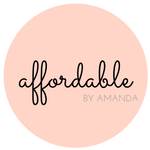 Thanks so much for stopping by Affordable by Amanda. Today's post is all about sweaters and jeans, with a glimpse into how I get my hair to look its best. I love stripes, and this lace sweater is just what I need for a chilly day out. The lace crochet details are slight and feminine. Now to my gorgeous pendant necklace-Kendra Scott makes the best pieces that seem to flatter mostly everything I wear! I've owned this pendant necklace for over two years, yes, TWO YEARS! and still seem to pair it with anything. Recently I was gifted this Elisa necklace for my birthday and also wear it on a regular basis. For my hair care I include a mix of Aveda hair products and Conair tools. I personally get my hair cut at my local Aveda and have done so for years. I've always had great results, and I even trusted them to dye my hair once! I love this Scalp Benefits Shampoo because it really gets rid of all the build-up that my hair develops over time. I have awfully oily roots and this stuff gets in there to eradicate it like a plague. That was dramatic but pretty much the best way to sum up the magic that this shampoo performs on my scalp. I highly recommend investing in it if you also suffer from super oily hair! For conditioner I only apply THIS product to the very ends of my hair because I do not want it to make my hair more oily. After I finishing washing my hair, I will let it air dry for a bit before blow drying it with my blow dryer and favorite round brush, both from Conair. Blow drying your hair helps it stay fresh and clean for days ahead! If I sleep on my hair while it is still wet, the greasier my roots will get. SHOP MY OUTFIT + HAIR CARE!